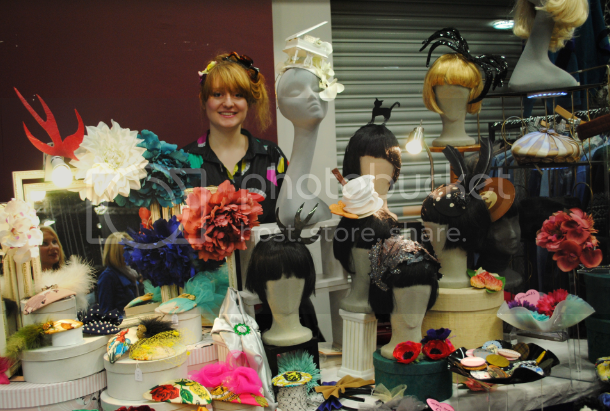 Yesterday, I went along to Judy's Affordable Vintage Fashion Fair as mentioned in my last post. BELT: River Island (from a playsuit). POINT OF FASHION: Autumn pastels. 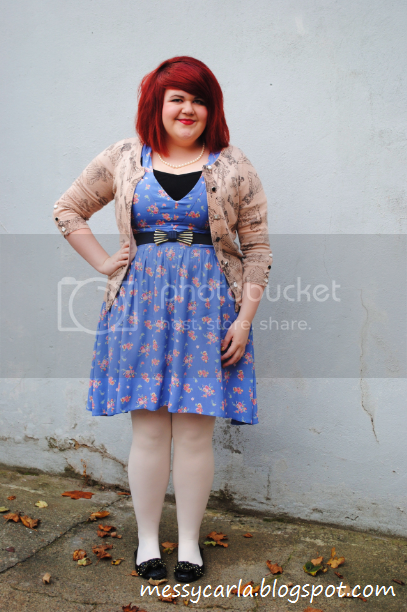 I bought this dress from Ebay last week for only £4 including shipping which was a right little bargain. I have NO idea why it is so low cut - it's not really decent for anyone to wear that low without a vest underneath, but I have a few plain black ones so it's not too much problem. It's also my first time wearing that cardigan since I bought it in New York back in June. I just adore it, but haven't been able to find something exact to go with it, but I love how it compliments the blue dress. Also, I LOVE white tights - they're such a welcome change from my regular black. Notice anything different about the picture? 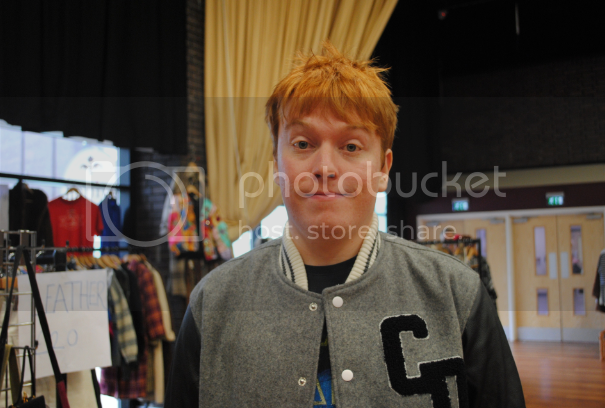 Yep, this picture was taking with my brand spanking new DSLR which I am in lurrrrve with. It was so frustrating to have a lovely new camera and nothing interesting to take pictures of for the first few days. The ever lovely Jayne of The Libertarian, one of my favourite independent designers. I love that she took down her "No Photographs Please!" sign so I could take this picture, teehee. Me and Sam trying on empty frames. We look a bit like Blanche Hunt and Deirdre Barlow. Sam's wearing a dress made by a local fashion student at (my alma mater) Newcastle College. My friend Neale in his new Criminal Damage jacket. 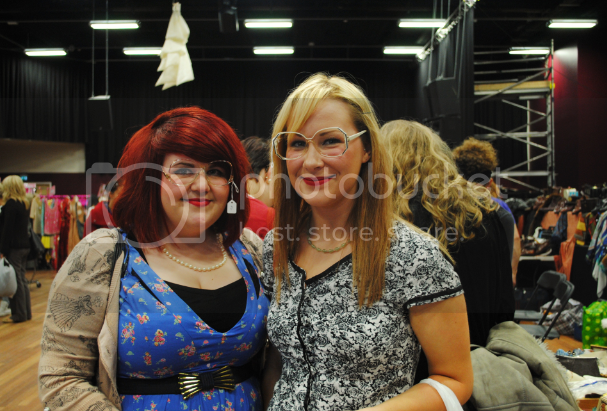 I was so pleased to see Rosie who I met whilst working together at the Vintage Kilo Fair. She was in charge of handstamping, and was wearing a beautiful floaty maxi dress from the 1970s. 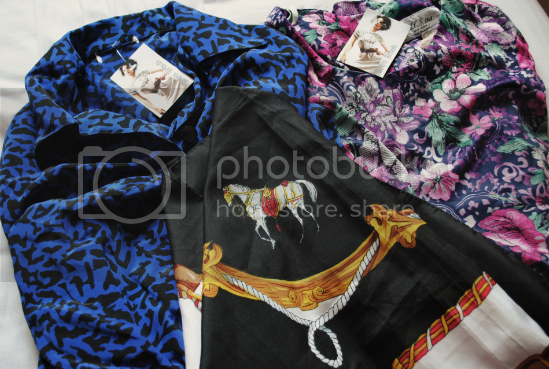 The dresses were two for £15 from Retro Rehab and the scarf was £3 from Princes Vintage. If you buy anything from Princes Vintage Ebay store, use the code NEWCASTLE to get 10% off your order. Sorry that you can't see the clothes properly, but I'm saving them for Outfit Posts, where you'll be able to see them all dressed up. Unfortunately I was unable to make it to Made In Newcastle's last day, as originally intended, as I wanted to catch up with my friend Poppy (who has a great blog called Bears and Bunting) as we haven't seen each other in aaaaages. Apologies if these took a little while longer to load, I've started using PNG files instead of JPEG for quality. I'm just experimenting with them at the moment from post to post - but please let me know! PS: I almost forgot to mention - the reason I'm putting my blog address on the outfit photos is because lately I've found my pictures being used on plus-sized fashion Tumblrs. it looks like the vintage fairs i go to in manchester, maybe next time i should travel further a field, looks like a really good day. I adore your outfit! I never realised how lovely white tights could look, I think I need some in my life! i love white tights. they're very flattering on you aswell, which is sort of the opposite of what we're told about white clothing. 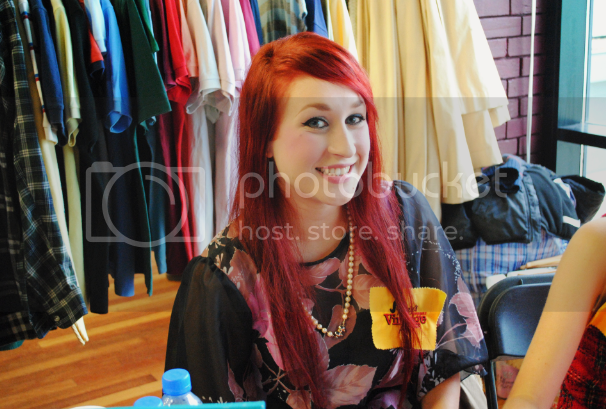 Such a cute outfit, and the vintage fair looks like so much fun! Victoria India: Me too! Awww are there not any near where you live? :( They're every few months up here. Kat-Face: Thank you, I love those tights. I love how opaque they are for white - when they're too sheer they just look like I have very pale legs! aroselikethis: Yeah Judy's fairs are at 18 different cities so it's probably the same company. But of course the local designers change from fair to fair. I'm so in love with you in this outfit! That cardigan is precious! I just adore it. and now I really need to get some white tights! EEE great purchases! I am a vintage junkie - I scour my Goodwill at least once a week. I'm a big fan of shirtwaist dresses with giant florals...and anything with a crazy pattern. LOVE LOVE LOVE the outfit. I love the outfit you wore - I have the same dress, except in black, and I'm not even big chested and its far too low cut on me!! Anyway looking forward to seeing the outfits you create with your new purchases. Little Scribbler: Yeah we noticed the prices have been dropped even more than last time! Last time the stall owners were a bit stingy - I had to barter a basic handbag down to £12, which was still a bit overpriced. Nicola: Thank you! Yeah, same my Primark is usually full of size 8s and 10s and nothing else. Oh Carla, I love this outfit! So ladylike and quirky at the same time. Such a cute outfit! I agree, sometimes it's necessary to wear something underneath, to protect one's modesty. Thanks for commenting on my blog!